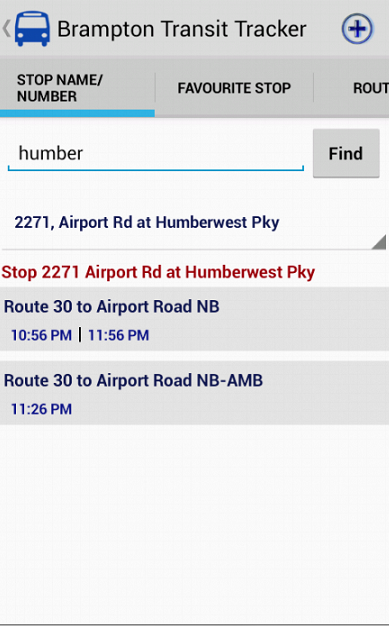 Brampton Transit Tracker provides real timetransportation information about Brampton Transit buses. Thisapplication retrieves information from the website, parses the dataand shows it to user more convenient way. To view predictions, user must insert stop number. Stops canalso be marked as favourites to avoid entering them every time.User can mark this stop as favourite by clicking the icon in thetop action bar. Prediction information will automatically refresh every 30seconds. This application is not affiliated with Brampton Transit. This application is only for Brampton city in Canada. TTC Tracker application provides reliable, real-time transportationinformation about TTC buses and streetcars. It helps users to trackreal-time timings about next buses/streetcars on any TTC stop.Userscan select route number, direction and stop name to retrievetimings of next bus/streetcar.Users can directly enter stop numberto quickly retrieve timings of all routes that provide services onthat stop number.Users can set any stop name/number as favouritestop and subsequently retrieve timings on just one tap.Users cangeographically track current location of bus/street car by usingmap view feature of the application which uses Google Maps to showreal-time bus location. This map will auto refresh at every 15seconds to update the vehicle location.Users can retrieve stopsnearby their current location to quickly check arrival timings ofall routes that provide services on that stop number.Additionally,this application provides access to the scheduled arrival times forselected stops. Users can retrieve the scheduled arrival time byselecting route number, direction and stop name and can store itfor later use. This can be useful when user does not have internetconnectivity and would like to see the scheduled arrival times. 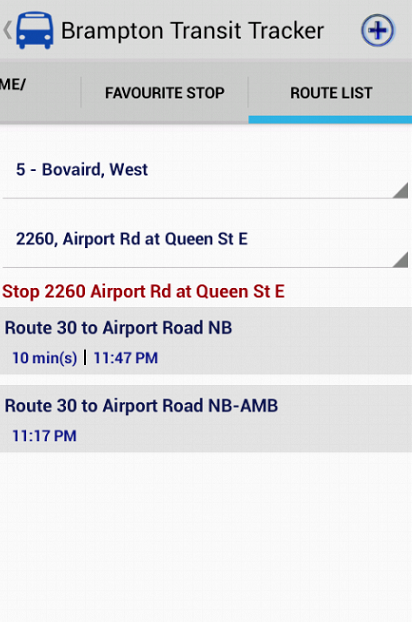 Brampton Transit Tracker provides real timetransportation information about Brampton Transit buses. Thisapplication retrieves information from the website, parses the dataand shows it to user more convenient way.To view predictions, user must insert stop number. 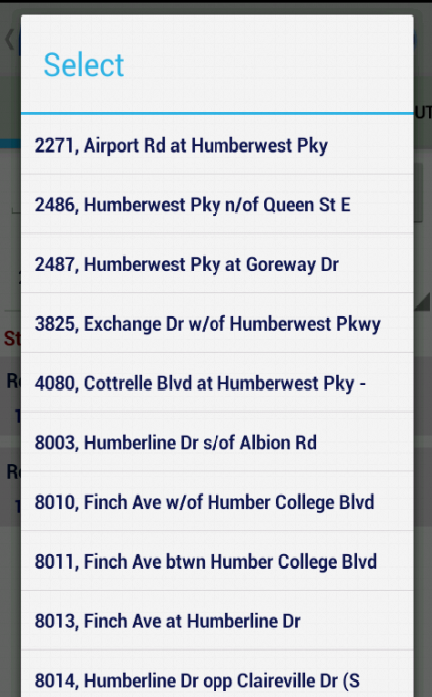 Stops canalso be marked as favourites to avoid entering them every time.User can mark this stop as favourite by clicking the icon in thetop action bar.Prediction information will automatically refresh every 30seconds.This application is not affiliated with Brampton Transit.This application is only for Brampton city in Canada. This is the only app you will need for MiWay in the City ofMississauga, providing a plethora of features to satisfy yourtransit needs. FEATURES • Offline Departure Times – Never worryabout an internet connection again! All departure times are savedlocally and load quickly. Times are organized into 3 tabs (Weekday,Saturday and Sunday/Holiday) that will automatically switchdepending on the current day of the week. • Closest Departure Times– Departure times that have passed are greyed out to improvevisibility of the closest departure times. • Graphical Start Screen– Easy to use and beautifully designed, this is your hub for all ofthe app's main features. • Saved Stops – Have a stop you commonlygo to? With this, you can save it for easy access later on! •Search for Route – Know your route number? Don't go through theentire list to look for it, simply type it in! • Stop Search – At abus stop and don't know when the bus is coming or which bus totake? 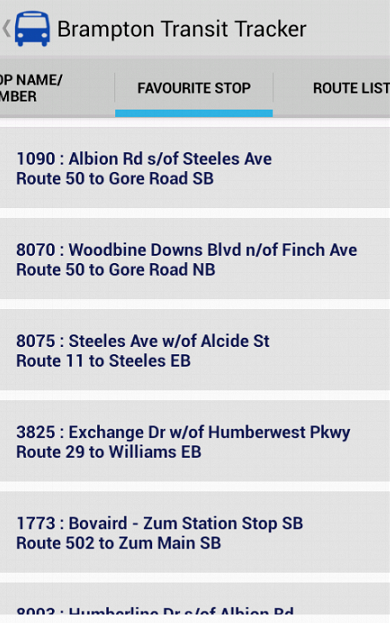 Enter the 4 digit stop number and choose from a list of allthe routes that service the stop! • Fares – Check how much it coststo take the bus. • Service Changes – View all of the recent servicechanges to see if the route you take has been changed. • Route Maps– Check the route map to see if it will reach your desireddestination. (Please Note: An internet connection is required touse this feature) COMING SOON These features are still indevelopment and will be added in a later release. • Real-TimeDepartures – Find out when a bus is expected to come and if it'searly or delayed • Bus Locations Map – Find out where a bus is onthe route This application was developed by Dy Developers and isnot associated with MiWay Transit. For any problems, concerns orsuggestions with the app, please contact us at:[email protected] Please Note: This application is notendorsed by, nor associated with MiWay Transit or the City ofMississauga. This is a third party application with all dataobtained from the official MiWay website and stored locally on yourdevice. Any issues or errors you encounter with this app should bereported by emailing us and not MiWay Transit or the City ofMississauga. Likewise, any issues you encounter with the busservice should be reported directly to MiWay Transit and not us, aswe have no control over the departures. For new devices, get the new 2018 app "Transit Now" for the bestexperience! Download here https://goo.gl/LMDfCW The ultimate TTCcompanion for real-time bus & streetcar tracking. 100% free.HIGHLIGHTS ► Real-time & accurate bus & streetcarpredictions for nearby stops. ► Customize favourite stops withlabels. ► Live countdown timer with voice announcements. ► TTCservice alerts for unexpected delays, detours, subway closures. ►"Are we there yet"? Get alarmed when you've reached your finaldestination. ► Share your predictions and arrival times. ► Subwaymaps including offline platform maps to increase commuteefficiency. ► Subway open-close times for schedule info. ► Send SMStexts to the TTC for real-time stop departures if you're offline. ►High-contrast & large easy-to-read text, colour-codedinterface. ► Accessible TTC features such vehicle ID to helpidentify wheelchair accessible streetcars. ► Optimized forperformance so that it can run lightning fast on older devices. NEW2018 MATERIAL DESIGN VERSION * For new devices, download herehttps://goo.gl/LMDfCW * Don't worry... We will continue to supportthe original app forever! BIKE SHARE USER? * Download Cycle Nowhere https://goo.gl/38Fdc5 Got feedback? Let's chat about yourcommute! @TransitNowApp https://instagram.com/transitnowapphttps://facebook.com/transitnowapphttps://twitter.com/transitnowapp Find us on iOS Click herehttps://goo.gl/TGSWPj Transit Now is an app that uses Nextbus forTTC real-time tracking, schedules, accurate predictions, arrivaltimes, bus tracking, streetcar tracking. This TTC tracker showssubway, offline maps, navigation, planning travel info for the TTC.Never miss your bus or streetcar. Transit Now... Not Later! Allfeatures 100% free. Try it out now! This app works by querying the PRESTO websiteand displaying the information in an easy-to-read format.• Supports GTA and Ottawa region cards, both registered andanonymous• Displays recent transaction history• Remembers the last tapped card and can refresh without cardpresent• Multiple cards can be used with one device. Handy to allowsomeone else to check their balance from your device.KNOWN ISSUES• This app only displays what the PRESTO website displays. It maynot reflect your immediate balance.• Registered accounts with MORE than one card added will NOT work.This will not be fixed anytime soon.Please leave feedback and feature requests from within the app,by tapping the Info icon or menu item, and scrolling to theFeedback section.This app is NOT affiliated in any way with, nor endorsed byAccenture, Metrolinx, Brampton Transit, Burlington Transit, DurhamRegion Transit, GO Transit, Hamilton Street Railway, MiWay(Mississauga Transit), Oakville Transit, OC Transpo, TorontoTransit Commission, or York Region Transit.